What links, the birth of a Swindon woman, the Work's hooter, a local radio presenter and a 5 year old photo? Recently I heard on BBC Wiltshire's Graham Mack Breakfast Show, that Graham was interested in getting the Work's hooter at the former rail works in Swindon working again. The hooter is still there, at what is now the Swindon Designer Outlet Village. He spoke to Jackie from Liddington about how she'd been born under the sound of the hooter, but because it sounded several times a day, she's never been sure of the exact time. 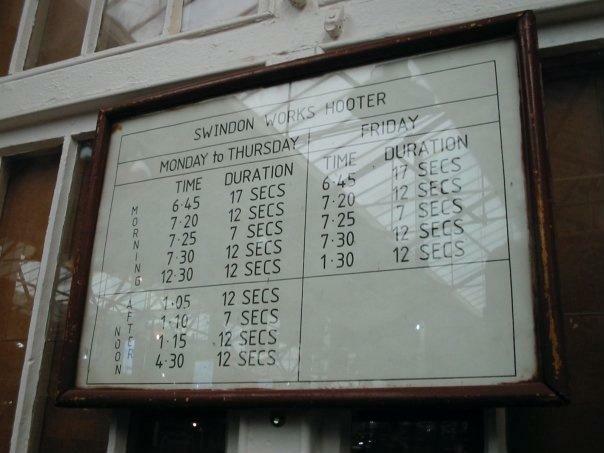 I remembered I'd photographed a framed 'hooter timetable' at the STEAM Museum several years ago, dug it out and posted it up on Twitter. Graham then spoke to Jackie again, and using the photo as reference, announced to her on the air that she must have been born at 4.30pm! Listen to the audio by clicking here, skip to 24.50 for the big hooter reveal! A nice little local story and a big part of Swindon's history.